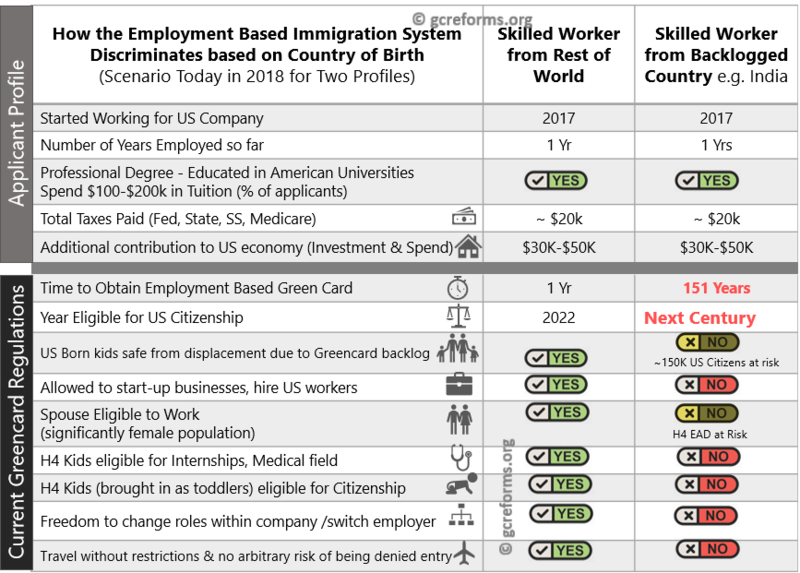 To begin with, the United States only offers 8% of green cards to skill based immigration. This is amongst the lowest in developed countries. 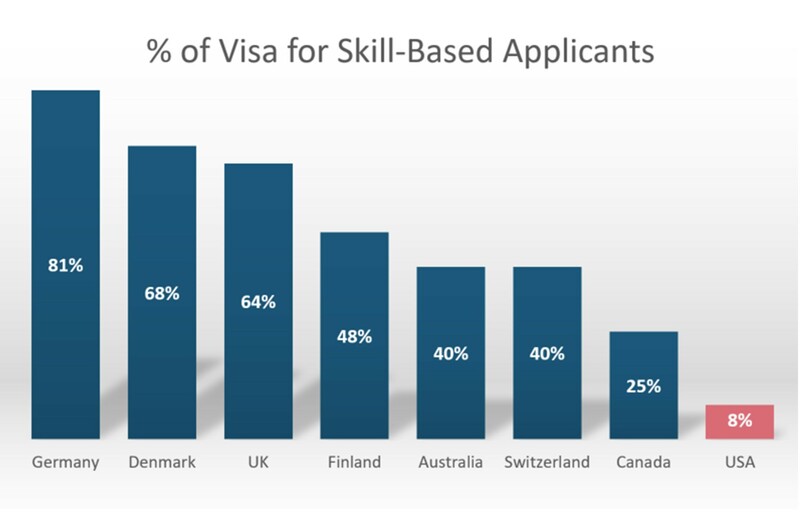 Indians are hired based on skill, but get permanent residence based on country of birth. The per country limits treat each nation equally, but not each immigrant equally. It is equality in theory but inequality in practice. 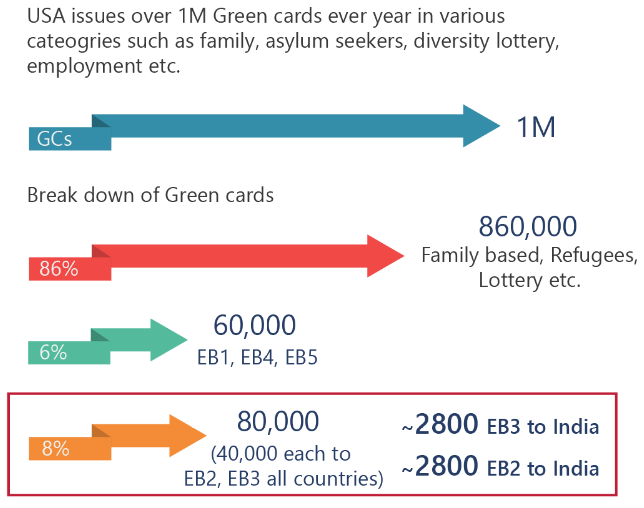 The 7% limit for green-cards is arbitrary and unfair, when 60% of visas are issued to the same country causing the backlog. 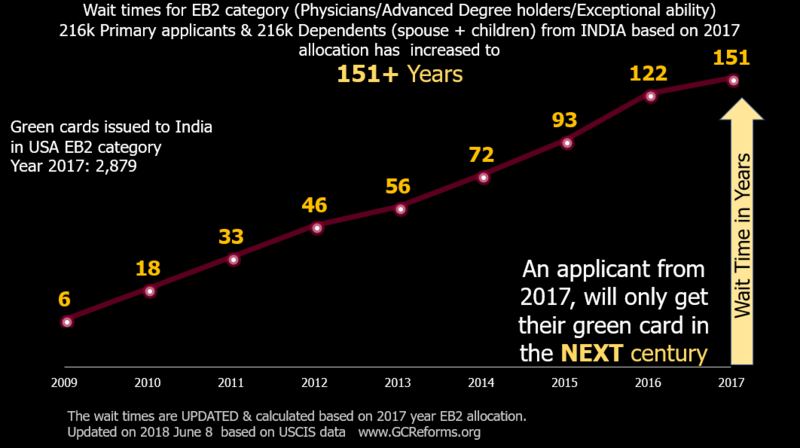 There is little hope for legal, high skilled employment based workers from India to get a green cards in their lifetime. If the per country cap is not removed neither will their kids! Based on data from Dept. 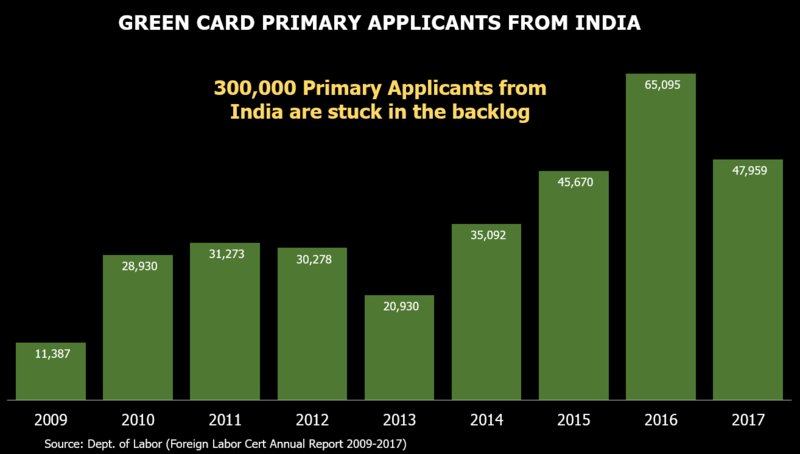 of Labor there are 300,000 primary applicants from India who are stuck in the green card backlog. This number is likely overstated due to multiple applications for the same person changing roles. 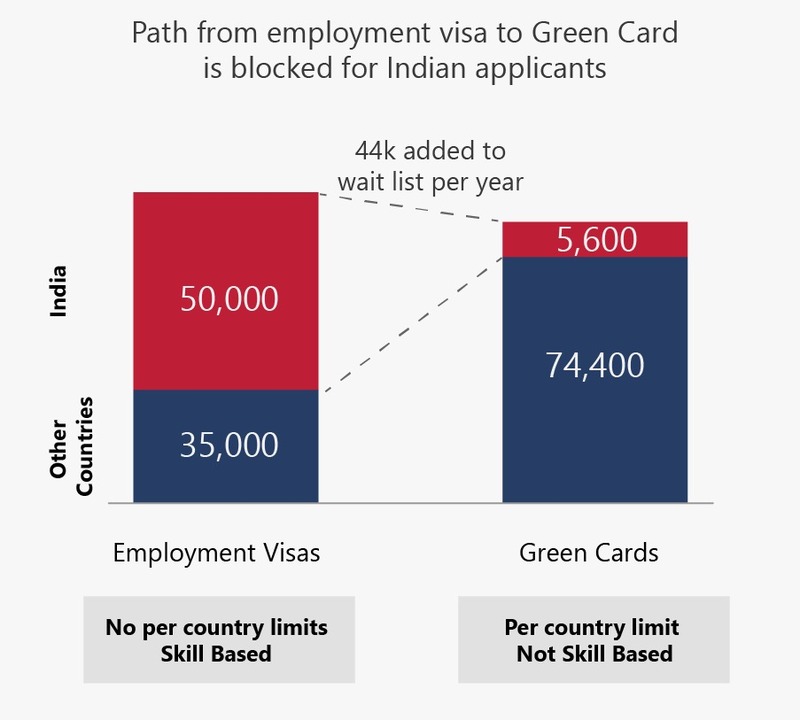 Removing per-country limits and visa recapture will shorten the backlog without increasing the number of green cards. High skilled Indian immigrants have to renew their visa every 3 years and get it stamped before they can file adjustment of status which takes decades. This is costly, time-consuming and risky for both employer and the employee and the process can take up to a year, during which the employee cannot travel outside the country for work. Family’s fear of getting stuck in their home country during arbitrary background checks and verifications while visa stamping which can take several weeks, even for simple visa renewals. While stuck in their home country, many employers back in the USA usually do not wait and they end the visa sponsorship. As a result, many have stopped visiting India to attend weddings, funerals and other important life events of loved ones. This is the cruel byproduct of the broken immigration system. If employers end visa sponsorship, it not only results in high skilled Indians losing their job, it will most likely result in fire-sale of houses impacting real estate prices in the area. Friends for years will be torn apart as the employee, spouse and kids have to leave the country in a matter of days. Legal immigrants impacted by backlog cannot create startups to generate more jobs. This prevents them from realizing their full potential and impacts the US economy. Several entrepreneurs have left the country and started Billion dollar enterprises in their home countries. Employees impacted by the backlog cannot invest freely in India or the US due to uncertainties of their resident status and constant fear of having to leave with short notice. When one lives in constant uncertainty, innovation/entrepreneurship always takes a back seat. A fair skilled based system is needed to produce the next Sundar Pichai, Satya Nadella, Vivek Wadhwa or Indra Nooyi. If any one of them applied for a green card today, they will likely get their greencards in the next century.